Above, Lost City school district's handsome native stone building erected by Work Projects Administration; lower, left to right, Birdchopper Whitekiller, Jonnana Pumpkin and Rachel Coffee, Cherokee Indians employed on the WPA school lunch-garden-canning program. Tahlequah—Five one dollar bills tell the story of how Birdchopper Whitekiller, full-blood Cherokee Indian living near Hulbert, this county, got the forepart of his ferocious name. When the Dawes commission was prowling- around the Five Civilized Tribes' country, enrolling Indians preparatory to dividing their vast domain, the board called at the home of Birdchopper's father, Buffalo Whitekiller, where found a new-born babe. The commission offered the daddy $5 if he would name the baby Birdchopper. The money changed hands and the papoose sure enough became Birdchopper. Birdchopper is any thing but ferocious. He is a peace loving citizen who takes great pride in his work as helper on the Work Projects Administration school lunch-garden-canning project at Lost City school. 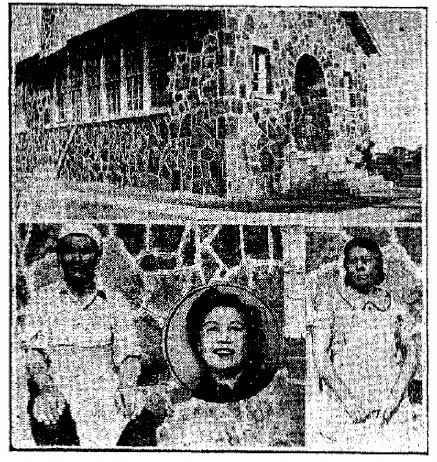 The WPA lunch cook there is Rachel Coffee, a full-blood Cherokee who does not speak English. Birdchopper is her interpreter. Eighty-five children, including 30 Indians, are benefiting from the health producing food WPA serves at the school, one of 1,510 in the state using this standard program that is keeping nearly 90,000 children above the malnutrition line. Over at Pumpkin Center school, this county, pretty 24-year-old Jonnana Pumpkin, full-blood Cherokee, does the cooking for the WPA lunch project that provides 30 children, half of whom are Indians with body-building food. She supports her father and sick mother. Jonnana's family name really is Watkins, but her grandfather, Tom, took 1o raising so many pumpkins that his neighbors named him Pumpkin and his community as Pumpkin Center. His descendants accepted the change and Pumpkin Center folks have never felt like calling their neighborhood by any other name. Source - Miami Daily News Record; Miami, Oklahoma; March 20, 1941; p.7.